A dog that had been missing from her home for four years has been found with serious injuries. Staffordshire bull terrier Zeena has a punctured eye and extensive bite wounds all over her body, which the RSPCA said were consistent with dog-fighting. The dog was found on The Leverretts in Handsworth, Birmingham, by a member of the public on 28 December and identified through her microchip. She is currently being treated at the RSPCA's animal hospital in the city. 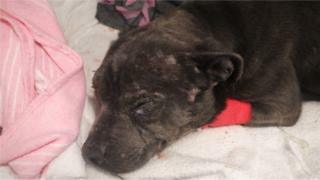 The RSPCA has launched an investigation into Zeena's absence and injuries. Insp Mike Scargill said: "The guess is that she was found by an unscrupulous person and brutalized horrifically. "It is heartbreaking to think what she went through but thankfully she has now been rescued from cruelty. "We are hoping very much that she will pull through this." He added that he had visited her original owner, who was "very shocked and upset". Anyone who recognises Zeena and may know what happened to her during the past four years has been asked to contact the RSPCA.